The NutriChef portable electric cooler works really well as a personal cooler/warmer because of its compact design and carrying strap. In fact, in some cars, the device may be able to fit between the front and right passenger seat. You can easily reach the temperature controls because they are conveniently located on the top of the cooler. Plus, the fan comes out of the top lid, providing clear, unobstructed ventilation. Want a Cooler/Warmer that You Can Use Pretty Much Anywhere? 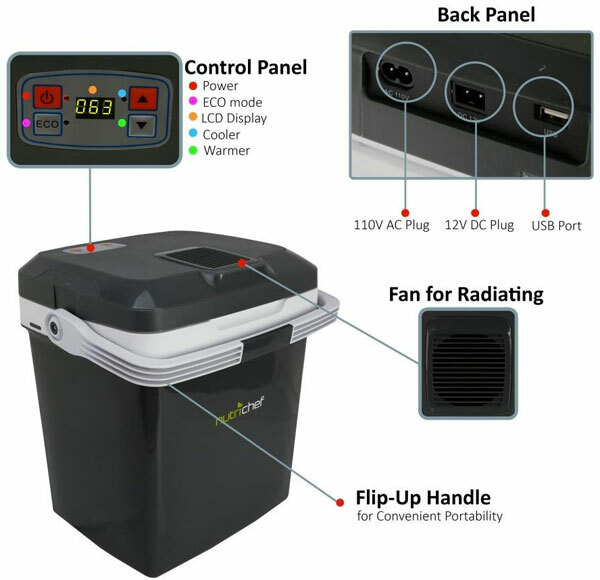 The compact size lets you place this portable electric cooler in more places – behind a seat, between seats, or in the back of the car. In addition, smaller personal-sized appliances take less energy and time to heat and cool. Bonus! Plus, you can power it up in your vehicle, at home or in your office. The package includes both a wall power cable and a 12V car charger adapter. The versatility gives you a lot more ways to use it, and I think this factor makes the NutriChef a much better value. 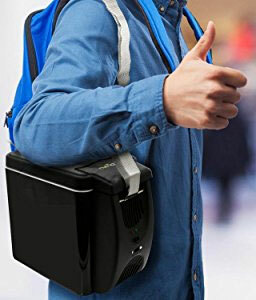 On top of the convenient carrying handle, this thermoelectric cooler also comes with a detachable shoulder strap. However, you may never even need to really use the handles. These personal coolers give you your money’s worth even if you never take them anywhere. Simply leave it plugged in by your desk at the office or at home on the patio or in the garage. Note: With both heating and cooling capabilities, you can keep food warm or drinks cool at the location within arm’s reach at all times. It’s better than a basic portable fridge in this respect, not to mention that it has significantly more storage capacity than most miniature car refrigerators. Probably the biggest problem I see with this gadget is that you get used to chilled drinks or hot food around you at all times. I mean, you don’t have to settle for lukewarm sodas or cold pizza. Seriously though, get ready to be spoiled. Also, I wish the lid had cup holders built into it like the Black and Decker car cooler. This would make it the ideal center console in the car. That said, the Black & Decker cant hold as many items.